Choo-Choo! A Scrap Orchard Blog Train! « October Mega Blog Train! I am here to bring you the next stop in the fabulous blog train from the Scrap Orchard Honeybees! But before I give you your freeBee, I want to mention a few things. First I want to show you a recent layout I made as one of the lucky Orchard Honeybee girls! I used a template from the fabulous Sine, a kit from Matahati, Wordart from the fabulous Bethany and some stitching and papers from Tracie Stroud. That is one thing I love about creating for the Orchard, there is so much talent there, you never have to look far to find exactly what you need for your layout! Click the image for full credits. If you like what you see, make sure you check out the Orchard next week for more details….the Orchard girls will be giving away some awesome free’bees’! Ok, I’ve made you wait long enough! 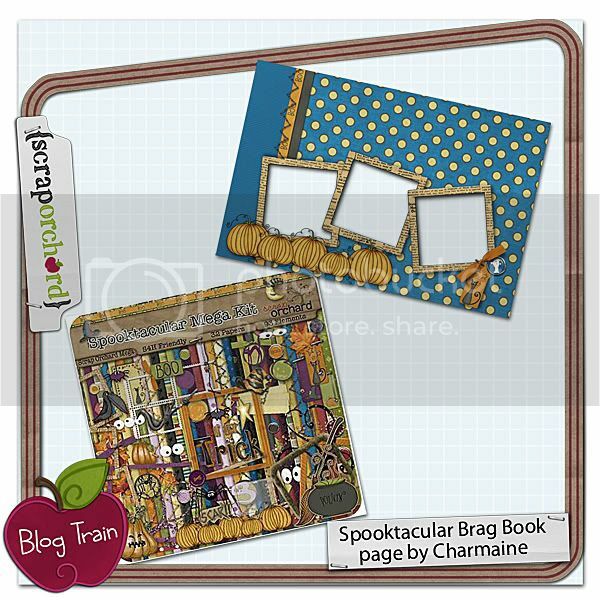 My brag book page is made from last year’s Halloween Mystery Mega, Spooktacular! Click on the image or HERE to download, and make sure you leave me some love! Cute! Thank you very much. Thank you for the BB page! Sweet page — Thanks much! Great BB page!! Thank you so much!! Hugs!! Love the brag book – TY !